Currently, the two most popular self-cleaning litter boxes out in the market are the CatGenie 120and the Open Air Litter Robot.The two use completely different technologies in auto-cleaning the litterbox. In this article, we'll compare the two and guide you in purchasing the right machine for your needs. A comparison between the Cat Genie and the Litter Robot. Setup Placed next to a toilet (needs access to water and an outlet). Can be placed anywhere, as long as next to an outlet. Resource Needed A toilet to dump its waste, water line for cleansing and an electrical plug Electrical plug. The Litter-Robot Open Air can be placed almost anywhere, as long as there's an outlet to plug into. The CatGenie 120 , on the other hand, needs access to a water line. Thus, it must be placed near the toilet or in the laundry room. In our case, the only choice we have is to place it in the guest bathroom since our toilets upstairs don't have enough room next to them. Placing the litter box in the guest bathroom can be inconvenient, as guests will have to deal with the odor and the litter tracking by your cats. Verdict: Litter-Robot Open Air due to its ability to be placed anywhere. 2) Technology Breakdown - How do they work? The technologies between the two contesters are quite different. Feces is then liquefied into a salid solution, and dumped into the toilet for proper sewage treatment. Great for allergies since there's no dust. If your cat has wet poops, this may not turn out so well. Litter is sifted through a screen and collected in the base below. Urine Removal Liquid drains right through to reservoir to an odor-killing saline solution. After urine clumps, it is disposed of just how feces is. Clean-up Clean water is injected into the basin with a cat-safe sanitizing solution. The genie then scrubs the granules, cleaning it, which are then aerated to dry. You're required to open the base drawer, and remove the waste manually once a week. Verdict: TIE CatGenie 120 for its fully-automated system, but Litter-Robot Open Air for its compatability with existing, non-proprietary products. The CatGenie costs around $259, while the Open Air Litter Robot Costs $424 with our discount. At first, this may seem like a no-brainer, as you'll be saving almost half your money by purchasing the CatGenie . However, let's calculate the cost of upkeep for both products and see what we find out. Explanation: 120 wash pack is $24. 2 washes per day, gives you 60 days' (2 months') worth. Through this calculation, you can begin to see how CatGenie's business model sells the device for cheap, but makes up for that lost revenue over the next few years. The Litter-Robot has a hefty base cost, but the upkeep is much more manageable. Verdict: Litter-Robot Open Air since after just 1 year, it's cheaper, uses propriety products and more manageable. Both the CatGenie and Litter Robot provide excellent odor control. The CatGenie eliminates odor by mixing the with a saline solution. It also cleans up the litter, thus eliminating any odor or dust. The Litter Robot traps odor in its drawer below, and includes a carbon filter. Verdict: CatGenie for its method of sanitizing and disposing waste right away. The Litter Robot comes with a 90 day return policy, and an 18-month warranty. The CatGenie qualifies for Amazon's 30-day return policy and a 2 year warranty. Verdict: Litter-Robot Open Air for its longer warranty and return policy. The Litter-Robot is said to be "a bit louder than a typical refrigerator". The Litter-Robot comes with a nightmode, where you can keep it from rotating for 8 hours. The CatGenie is "quiet as a purr" during 26 of its 30-minute washing period. The CatGenie takes around 32 minutes to clean the litter completely. The Litter Robot, on the other hand, only takes about 2 1/2 minutes. The Litter Robot comes with a night light in case your cat has difficulty seeing in the dark. It also indicates when the drawer is full, and is great for multiple cats. The CatGenie is great for the environment, as its washable litter granules are biodegradable. Additionally, the litter is produced in a clean, sustainable manner with minimal energy used in transport. Verdict: TIE CatGenie 120 if you're environmentally friendly, but Litter-Robot Open Air if your cat can't see that well at night. Overall, we recommend the Litter Robot because it is cheaper, can be more conveniently placed around the house, and is virtually odorless. 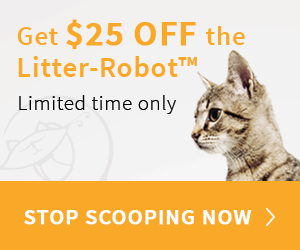 Since we vouch so highly of the product, we decided to team up with the company and provide 25$ off at Litter Robot with our Link! Hopefully now you know the differences between the Cat Genie 120 and the Litter Robot. Have any questions or thoughts? Comment below!